Spanning four plants and employing over 320 people in China, Advance Printing Company, established in 2001 and headquartered in Suzhou, is one of the country’s most successful privately-owned label converting companies. Owner and dynamic entrepreneur, May Cai, leads a management team that has seen Advance Printing become the leading user of Mark Andy technology in the PRC, with a current total of 13 flexo presses in commercial operation, all installed within the last 10 years. Suzhou Advance Printing Company President May Cai (left) with Key Account Manager Vivien Shi (right) and the latest of the company's 13 Mark Andy flexo presses. Advance Printing Company has held ISO 9001 and 14001 certifications since 2003 and is aware that the path to profitability is the diversification of their book of business. This has led the company to invest in packaging solutions as a complement to their current label offerings. When considering the massively expansive population and sharp increases in transported good, intelligent labels - made with RFID technology, a specialty application available on flexo presses - are a booming business, seeing something of a renaissance in China. 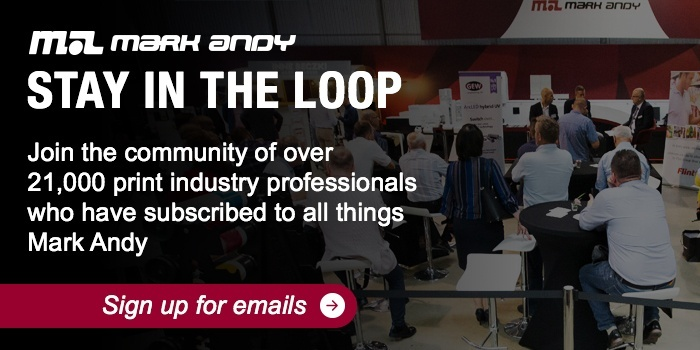 Advance Printing knows the importance of investing with the right manufacturers, and in Mark Andy found the perfect partner for flexo presses. With a history of 10” and 13” legacy 2200 and LP3000 lines, the company now has nine of the bestselling Performance Series presses. All have the 13” (330mm) web width with up to 14 colors and a full suite of added features. Five of the Performances Series assets are located in Suzhou, with the remaining two in Guangzhou. All have UV capability, and some have dual water-based drying/UV curing units. Currently, the presses are working around 40% paper-based substrates to 60% filmic, but Cai says the demand for film is growing fast and is impressed with the Performance Series’ ability to hold register at high speed. Building on this core competency, the manufacturer recently debuted the P9E, the ideal flexible packaging and film solution. Along with locally manufactured translative offset presses and a toner-based digital machine, the company produces 200 million labels each month and generates sales of Yuan 230m per annum. This top level of business has been won by creatively using existing technology, including a combination of flexo and screen printing on the Mark Andy Performance Series lines that has produced outstanding results on anti-counterfeiting labels. This has special application in the Asian market, particularly on high-value goods, and the leading global brands are keen to work with inventive converters like Advance Printing to protect their market share and product image. Company strategy for future success is based on several key fundamentals: individualization, customization, uniqueness, traceability, fast turnaround, and transparency via the internet. By employing these tools, Advance Printing believes it can create a fusion of added value with innovation and cost-effectiveness to secure more business. Already self-sufficient from design studio to post press converting and shipping, Cai interjects her role is to integrate these various functions to gain reverse traction of consumer demand for the brand. “Small label – big function will help brands and enterprises to grow,” she explains. Advance Printing is also proud of its green credentials, which has seen leading brands including L’Oréal, Mars, Danfoss, Henkel, Disney, and Lego all give the company their stamp of approval via independent audits. This environmental conscience extends to carbon emissions from the factories, which in 2017 were running at 10% of the national average, to the increasing use of LED lamps in UV drying to reduce energy consumption and VOC emissions, the use of electric vehicles for deliveries and employee transportation buses and the use of non-woven fabric instead of traditional waste rags. 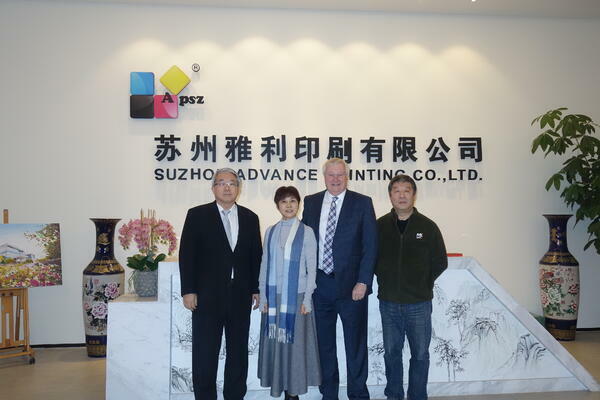 Suzhou Advance Printing Company President May Cai with Partner/General Manager Mr. Zhong (far right) and Mark Andy representatives Benny Shaw (far left) and Nick Coombes (middle right). With ambitious plans for growth, including new plants and technology, Advance Printing is already looking closely at the Mark Andy Digital Series HD True Hybrid platform to expand their digital as well as additional Performance Series E flexo presses.